West Street Live presents an acoustic night with…. ENTRY £5 on the door, includes a ticket for the prize draw! PRIZE DRAW – Win Silverjet tshirts, Lush goodies, A Spa treat for two at 1877 Spa, Sheffield-made gift-boxed kitchen scissors from Ernest Wright and Son Limited, a bottle of liquor from West Street Live, a box of chocolates….and more! 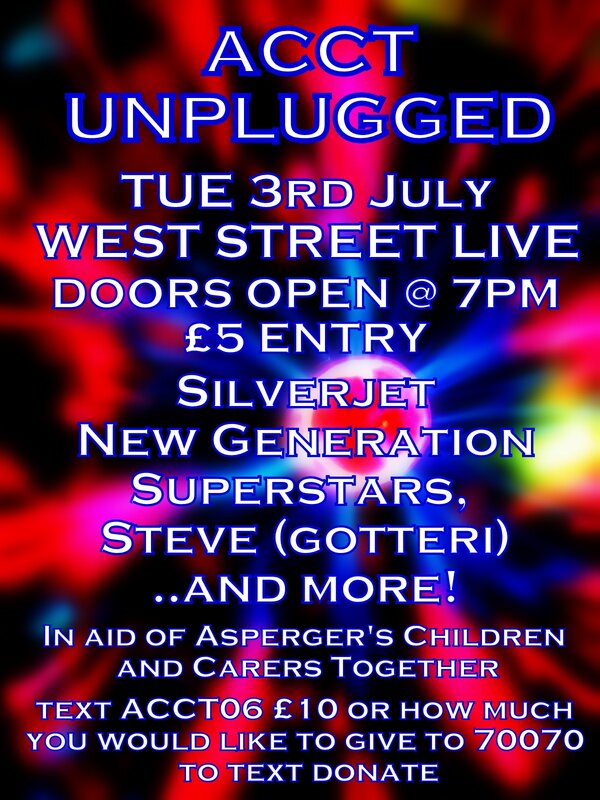 All this will be fundraising for Sheffield charity Asperger’s Children and Carers Together….ACCT, who support over 220 families across Sheffield who have a child with Asperger’s Syndrome or Autism Spectrum Disorders. They provide support, advice, clubs, days out, sports, workshops, autism friendly cinema trips and a coffee drop in for parents. Make a donation on the night, buy a prize draw ticket or donate by text giving just text ACCT06 £5 (or whatever amount you would like to donate) and send to 70070. WE MADE AN AMAZING £686 AT THIS EVENT…THANKYOU TO ALL INVOLVED FOR HELPING TO SUPPORT ACCT. These worshops will run for five days each, three to be spent making the animation and a further two making the accompanying music with a specialist worker and ACCT staff. Each week will have a different theme so you can book on to both. These workshops are not open to siblings at this time. Get into the Olympic spirit this summer and create your own sporting animation. We will be exploring a variety of different animation styles, including claymation, lego, object animation and pixilation. Whether you want to create an animation celebrating your favourite sport, your own sporting achievements, or want to imagine your own opening ceremony, we have the animation for you, all you need to bring is your imagination! Finish the week by adding sound to your creations, creating your own gold medal short film! This summer, the supernatural will be coming to ACCT! We will be exploring a variety of different animation styles, including claymation, lego, object animation and pixilation. Whether you want to re-imagine your favourite fairytale, create the next vampire movie or make up your own legend we are here to help, all you need to bring is your imagination! Finish the week by adding sound to your creations, creating an animation the Brothers Grimm would be proud of! Each session running from 10am to 4pm. Each session running from 10am to 1pm. The child must be at least 8 years old to take part. Children joining year 8 in September can come to either the teenager or the Acctivate club, but not both. Please contact Emma Shepherd to book on 07527 824034. Beginning on June 20th ACCT are running a Trampolining club at Ponds Forge. The club will run every fortnight until October 24th 2012. The club will run for one hour, from 5.30pm to 6.30pm. Please arrive five minutes before the club is due to start. Children must be at least 5 years old to take part. The club will be run by a qualified trampolining coach, and ACCT staff will be on site to support the children to take part, so parents do not need to stay on site. If parents would like to stay on site, there is a viewing area, or you can come and get involved in the activity! It is essential to book your child onto this activity if they wish to attend, places are limited to one session per child so everyone may take part. The following dates are open for booking now: June 20th, July 4th, July 18th, August 1st and August 15th.